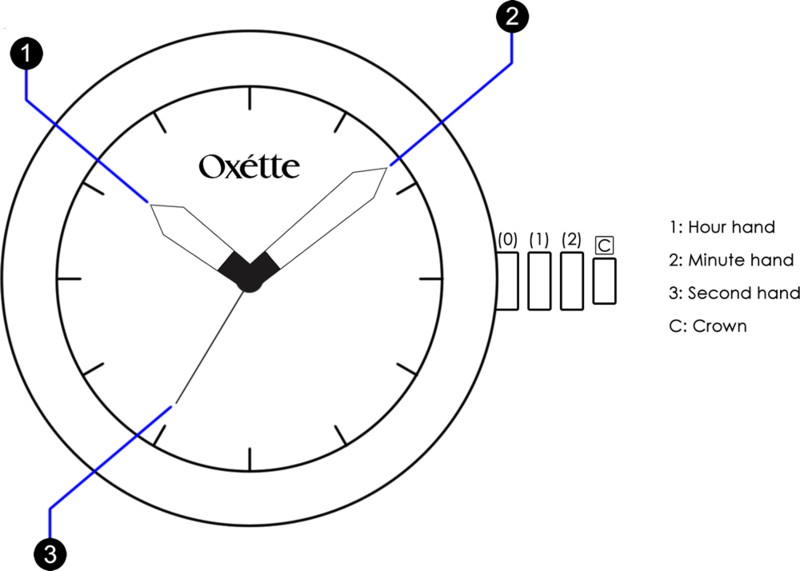 Thank you for purchasing an OXETTE watch. For proper use, please read the directions carefully. The following warranty applies to watches sold or presented for warranty service in any country. Your Oxette watch is guaranteed for 24 months from the date of purchase. In order to benefit from this warranty, you will be required to present the Warranty Certificate fully and correctly completed by an Oxette store or an authorized Oxette dealer. During this 24-month warranty period, any part found to be defective as a result of a manufacturing error shall be repaired free of charge. This warranty does not cover damages due to improper use, lack of care, accidents and normal wear and tear of the crystal, strap, bracelet or battery. There is a six-month period of complimentary battery replacement. When the 24-month warranty period has elapsed, the owner of the watch bears all repair, postage, insurance and shipping costs. If a product needs repair or replacement , whether the warranty is valid or not , delivery and shipping costs for all abroad destinations bears the consumer , otherwise it is free of charge to pick your product from the boutique of purchase or any authorized dealer within Greece. We strongly recommend that the service of your watch and any repairs be undertaken by an Oxette store or authorized Oxette dealer. Each watch has a unique serial number, referenced on the Warranty Certificate. This enables us to provide you with personalized and efficient service. Please retain this certificate as proof of your watch’s origin and authenticity. This warranty does not cover crystal, metal, or rubber parts. This warranty does not cover scratches or any other defects caused by abnormal or abusive use, to be ascertained at the discretion of the authorized Oxette dealer. This warranty is valid only if properly completed, dated and sealed by an authorized Oxette dealer and/or accompanied by proof of purchase. Oxette has the right to waive any liability for repairs under this warranty, if the watch has been damaged by non-authorized service. Photocopies of the Warranty Certificate are not accepted. This warranty does not affect the watch owner’s statutory rights. The warranty is voided if the watch is damaged by natural disasters such as fire, flood or earthquake. Your watch is water resistant to a minimum of 3ATM, which means against light moisture such as rain and splashing in general daily use. It should not be submerged in water. The water resistance of your watch is assured for 24 months as part of your Warranty Certificate. Water resistance is maintained by a series of seals, which will deteriorate over time due to general wear. We recommend that you get your watch checked at an Oxette store or authorized Oxette dealer every two years, to replace any worn seals that may affect the watch’s water resistance. Avoid leaving your watch in any extremes for long periods of time – direct sunlight, extreme heat or extreme cold. • Extreme heat may cause malfunction and shorten the life of your battery (Quartz). • Extreme cold may cause your watch to run fast or slow. Never operate any of the function buttons or crown when the watch is submerged in water. Should water or condensation appear inside the watch face, have the watch serviced immediately. Water may corrode electronic parts inside the watch. • Avoid wearing your watch in the presence of strong chemicals, solvents or gases. They may cause discoloration, wear or damage to the case, strap and other components. Avoid strong electrical fields or static electricity which could harm the mechanism of your watch. Generally, your watch is not affected by magnetic fields from household appliances, such as television sets or stereos. Wearing a watch every day can result in grime and sweat buildup. In order to ensure a longer watch life, clean it regularly. Clean your watch with a soft cloth. Do not submerge your watch in water. Metal watch bracelets should be washed periodically to maintain their beautiful appearance. Clean with a soft brush dipped in slightly soapy water. Be sure to wipe dry thoroughly with a soft cloth. Plastic or rubber straps: gently wash with water. Do not use cleaning solvents. Leather straps: gently rub the surface of the strap using a soft dry cloth. This watch is a piece of jewelry and must be treated with care. We cannot accept liability for dislodged stones or damages caused due to product misuse. If a battery is accidentally swallowed, call a doctor immediately. WATER RESISTANT 3ATM: Safe only for accidental contact with water drops. A watch with 3ATM WR is ΝΟΤ considered waterproof. WATER RESISTANT 5ATM: Suitable for surface swimming and showering. WATER RESISTANT 10ATM: Suitable for all swimming. 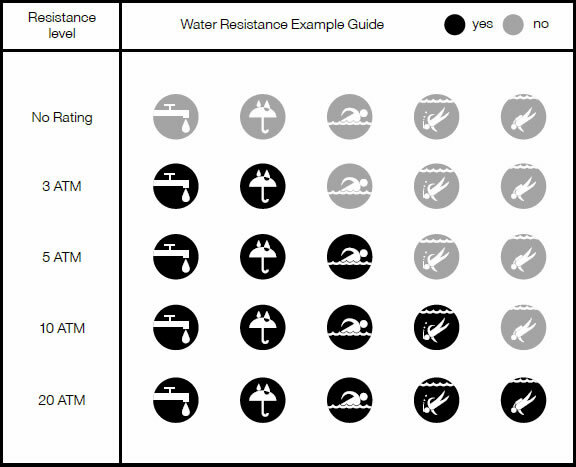 WATER RESISTANT 20ATM and more: Suitable for diving. Only Oxette stores and approved Oxette dealers are authorized to provide the Oxette International Warranty. The warranty does not cover watch service or repairs by any person not authorized by Oxette or its representatives. In the event of a claim under warranty, please contact your nearest Oxette store or authorized Oxette dealer. Contact details can be found at oxette.com. This international warranty does not affect your statutory rights pertaining to the sale of consumer goods, which are applicable under national legislation at the point of purchase. The crown of your watch should be in position (0). Pull the crown out to position (1). 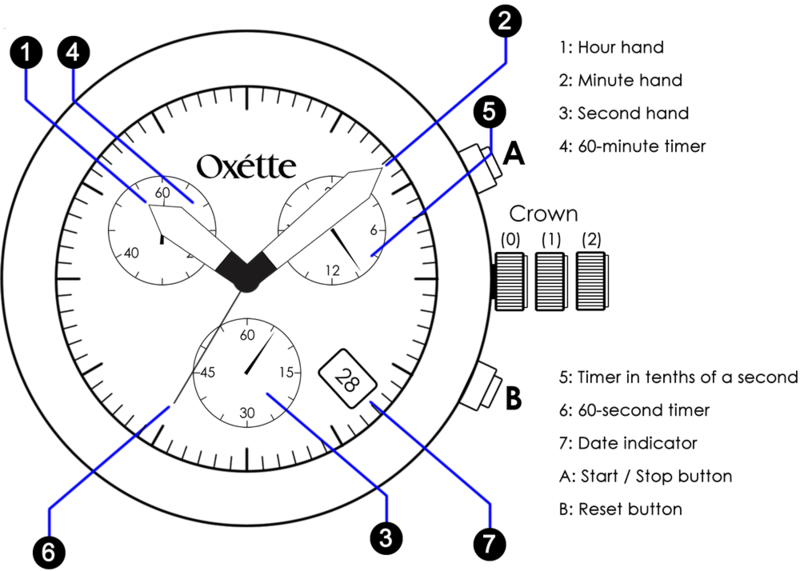 Turn the crown to move the hour and minute hands to the desired time. The seconds hand will stop while this is in progress. 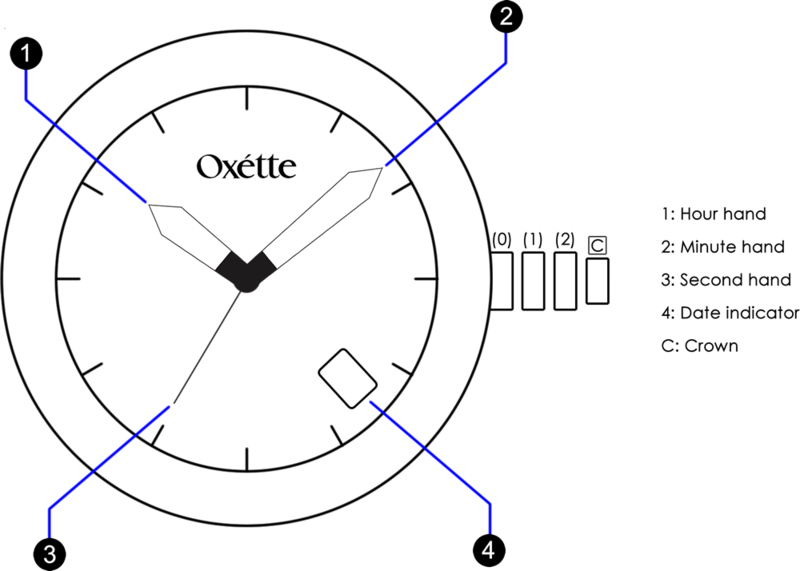 After setting your watch to the correct time, push the crown back in to position (0). Pull the crown out to position (2). To set the time, turn the crown to move the hour and minute hands. The second hand will stop while this is in progress. After setting your watch to the correct time, always push the crown back in to position (0). Turn the crown rapidly until the desired date appears. The date is set by returning the crown to position (0). Turn the crown to set the time. The second hand and the watch movement will stop, as an energy-saving function. Turn the crown to change the date, advancing days with full 24-hour rotations. After the date has been set, push the crown back in to position (0).